I’m hosting the baking party of the Great Bloggers Bake Off this week for the very lovely Jenny from Mummy Mishaps. This meant being the most organised I’ve ever been and actually baking before the week’s GBBO airs, a first for me. This week the bakers had to tackle cream horns – little puff pastry delights filled with whipped cream, then mokatines – elaborately decorated coffee cake, and lastly the showstopper challenge was religieuse a l’ancienne – choux buns filled with patisserie cream and stacked and decorated with chocolate ganache and cream. When it came to choosing something to bake my heart wanted to do the religieuse – I did the mini religieuses a couple of years ago and they were so good – but my head said no. I would have needed to host a party for it all to have been eaten the day I made it. I love coffee but am not a huge fan of coffee cake so the mokatines were cast aside, leaving the cream horns. I’d never eaten a cream horn before this week. I don’t think I’ve even seen them in the bakery. Pastry and cream though, what’s not to love. 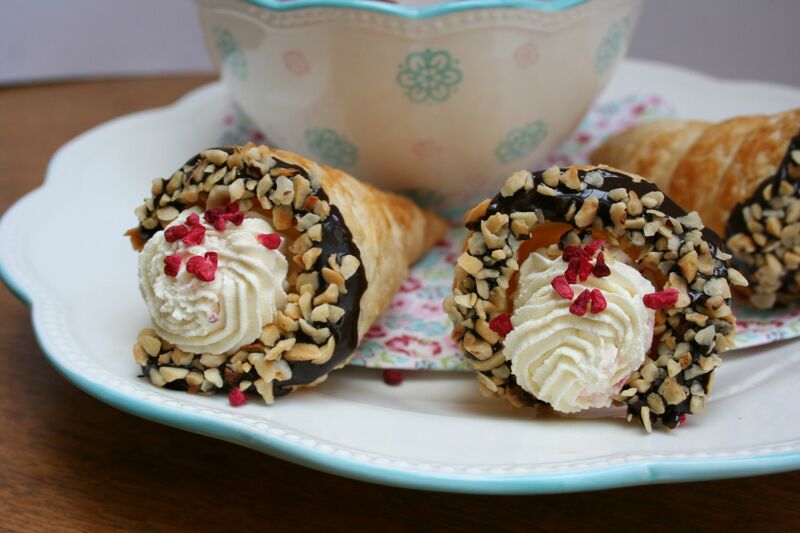 I followed Frances Quinn’s (of GBBO 2014 fame) raspberry cream horn recipe and the pastry turned out amazingly good. 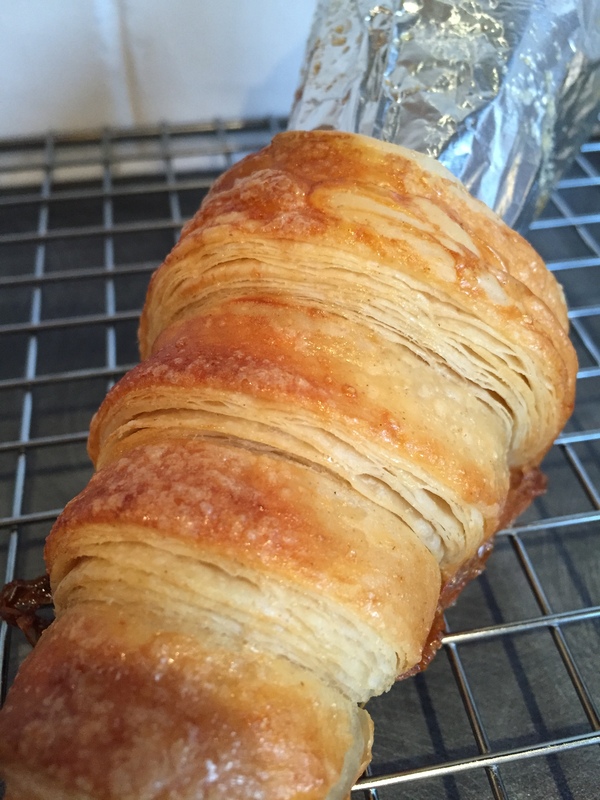 Yes, a bit of time required to roll and rest but so worth it for the crispy layers that magically popped up in the oven. So, let’s dive in with the pastry making. Frances’s recipe suggested chilling the flour, which I’d never done before, and maybe that was the winning tip. While the pastry was resting between folds and rolls I got on with making some cream horn moulds. 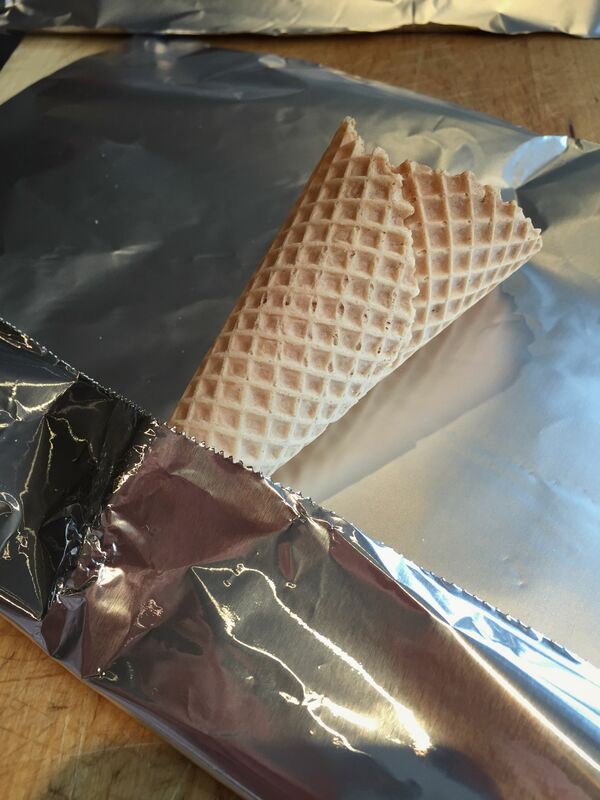 I wrapped foil over waffle cones – all very high tech! 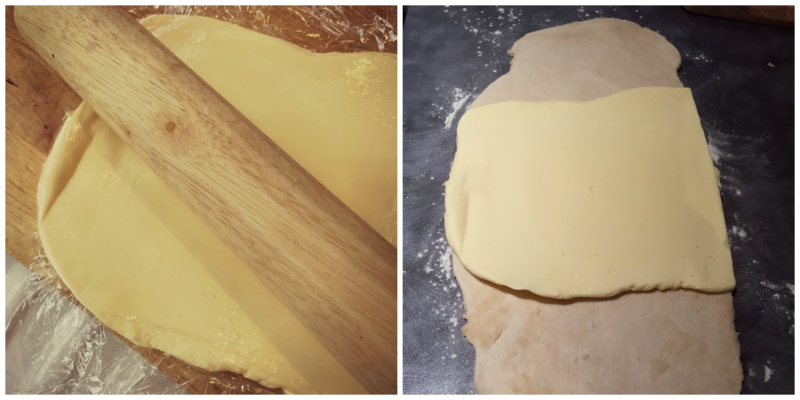 Next step was rolling out the pastry, cutting into 1cm strips and wrapping them around the moulds. The very start of the wrapping was difficult as the moulds were all slippery from being sprayed with oil, but once you get past the first wrap the rest of the way up was much easier. In they went to bake. The recipe said to bake for 10-12 minutes but mine needed 20 minutes. Maybe they were a bit thicker than Frances’s. Not sure, but they came out and onto a wire rack to cool and slipped off the moulds with no problem. Phew, I was stressing a bit about that step. While they were cooling I made a simple raspberry coulis, whipped some double cream with vanilla seeds and melted the chocolate for dipping the cones. 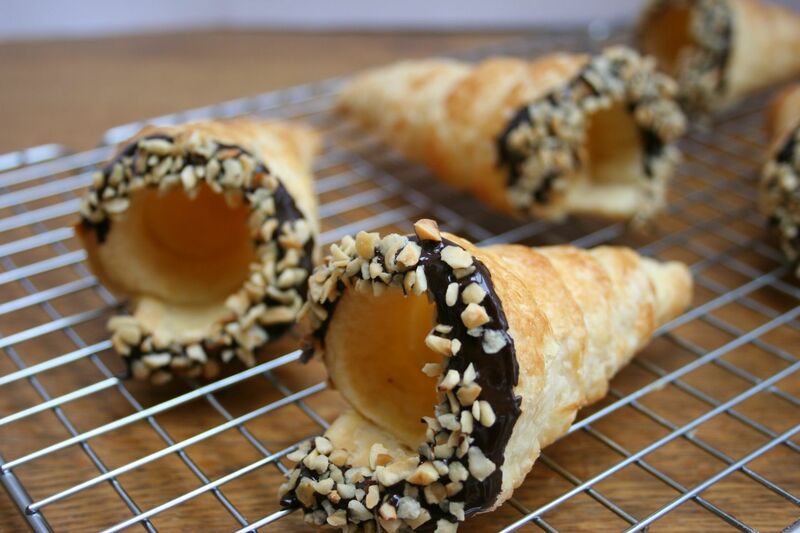 I dipped the cones in dark chocolate then chopped hazelnuts and set aside to prepare the filling. 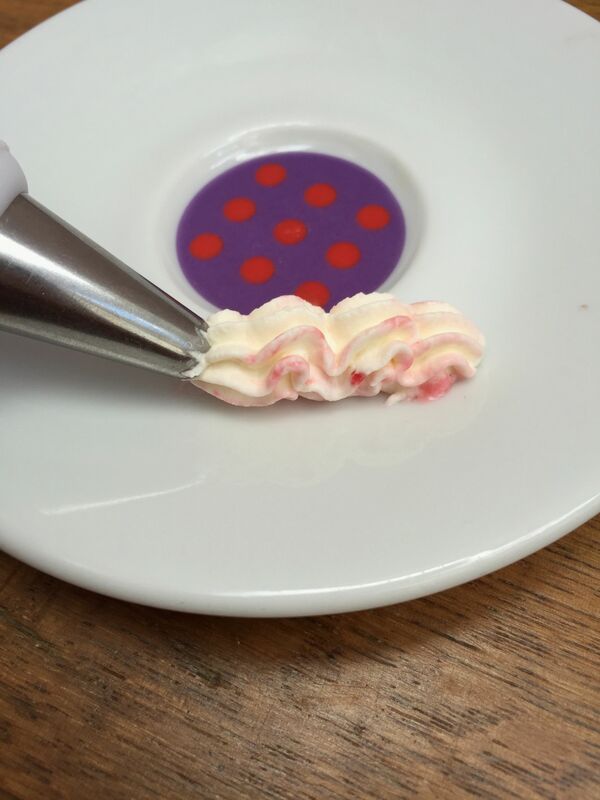 The whipped cream went into a piping bag with the raspberry coulis. I didn’t get a perfect ripple, more like it just blended together as I filled the cones, but delicious nevertheless. 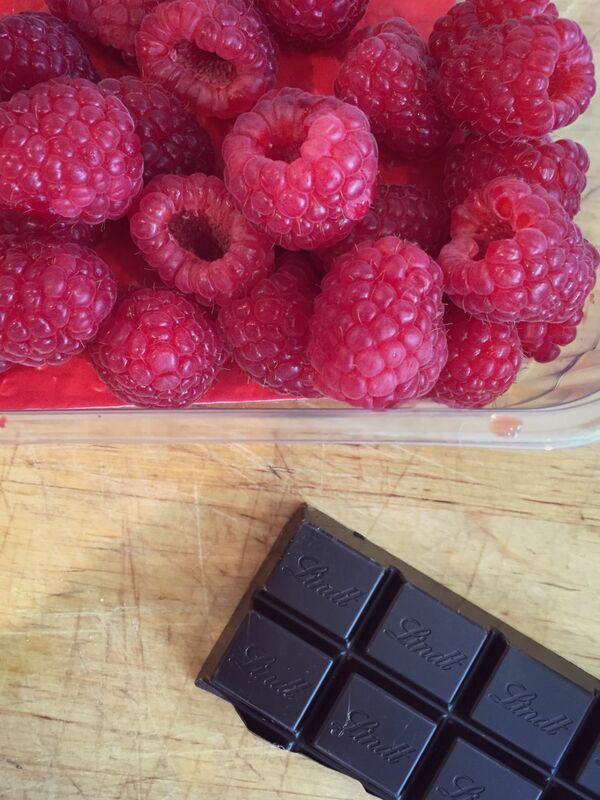 A little sprinkle of freeze-dried raspberries and they were all done and ready to devour. 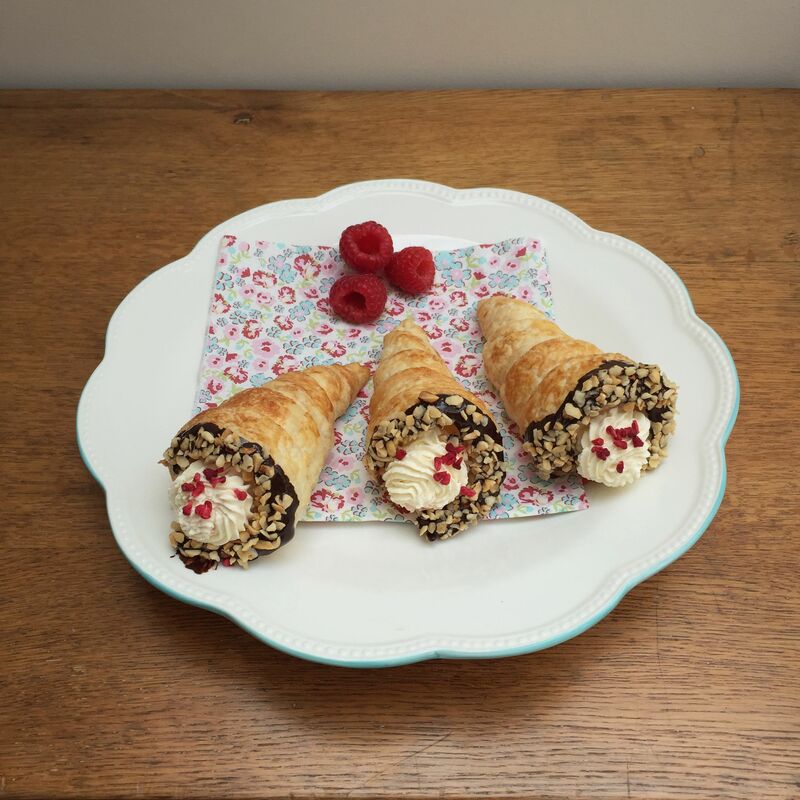 You are supposed to be able to store the cones in an airtight container for a day or so and fill as you want to eat them but mine went a bit soft by the following day…so be prepared to eat a lot in one day, or have a cream horn party! What did you bake this week? If you feel like joining in, link up with Mummy Mishaps and go see everyone else’s fantastic creations. Linky will open at 10pm tonight! These look so good and very professional looking. 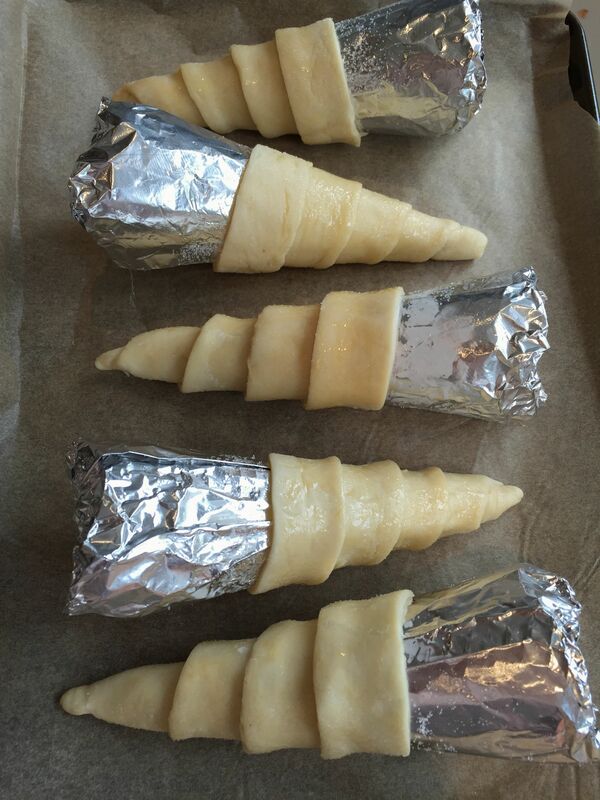 I too tackled the cream horns this week (yet to be posted) and I certainly agree that the bake takes longer than 10-12 minutes, mine actually took nearer to 25 -27 minutes!!! They look amazing. It was very clever to use the wafers to shape the horns. 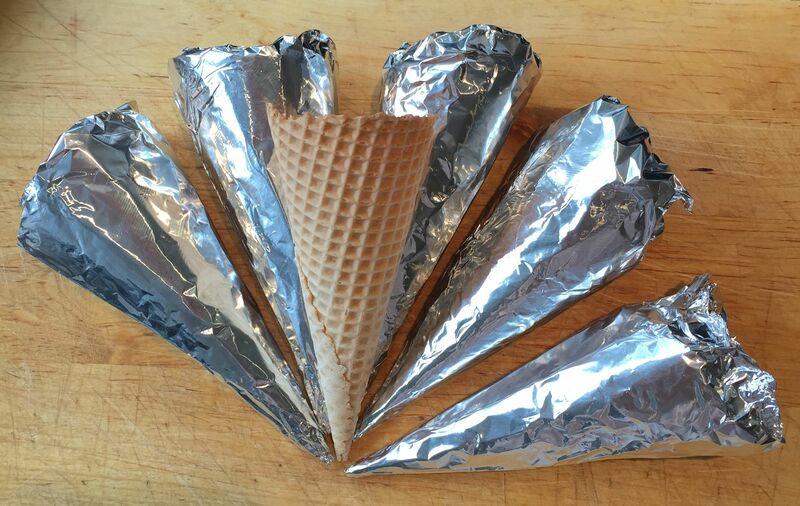 These look delicious and I love your creative way of using the wafer cones to shape the pastry! Thank you. Think I need to work on my rippling so it doesn’t all smoosh together…but that won’t be too arduous. 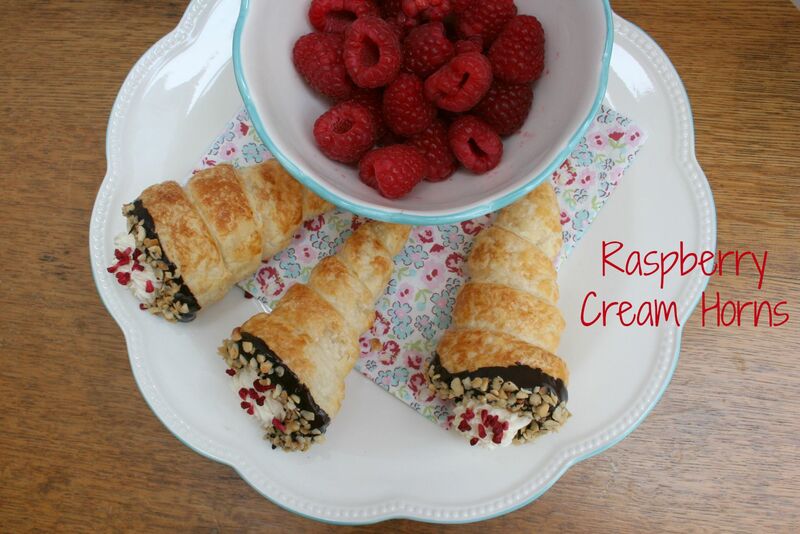 Cream + raspberry = yum! Deep thinking – adds a new dieonsimn to it all. Im not sure I like it… Every time I view a vid and want to add it to my playlist, it immediatly switches to the next video according to the results and I dont have time to add it. Plus What if I just want to rate and not add? And its a LOT slower. Im impatient and it takes forever to load. And it is NOT my comp. Its usually fast on this and any other site. These look so good and such perfect flavourings too…I wish I had tried to make these now! Simply gorgeous. I really want to sink my teeth into one. I’ve never tried a cream horn before. Your cream horns look so delicious, and I love the decoration. What an lovely indulgent treat! They tasted as good as they looked! Stunning!